I just realized as I was composing this recipe that it must appear that we eat lots of pork, perhaps it appears to be an unusual amount of pork. I admit I love pork, but we only eat it once every other week or so. 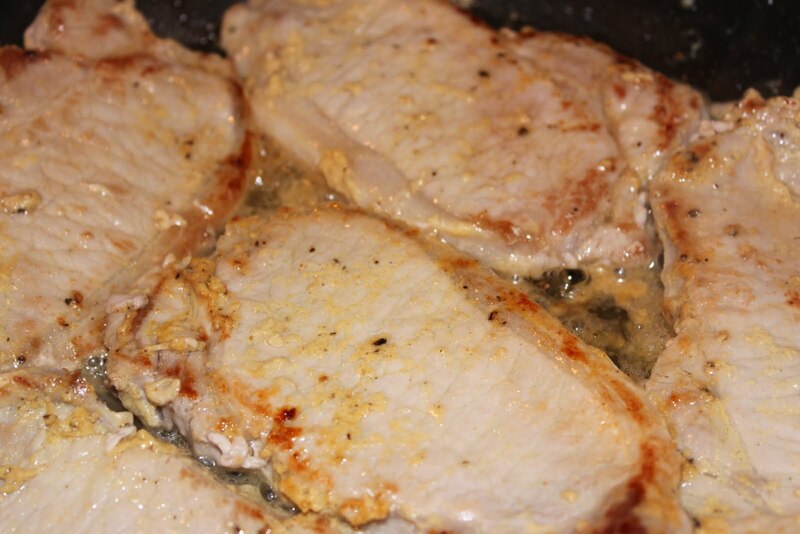 It's just so much easier to come up with fun recipes like this to showcase pork. 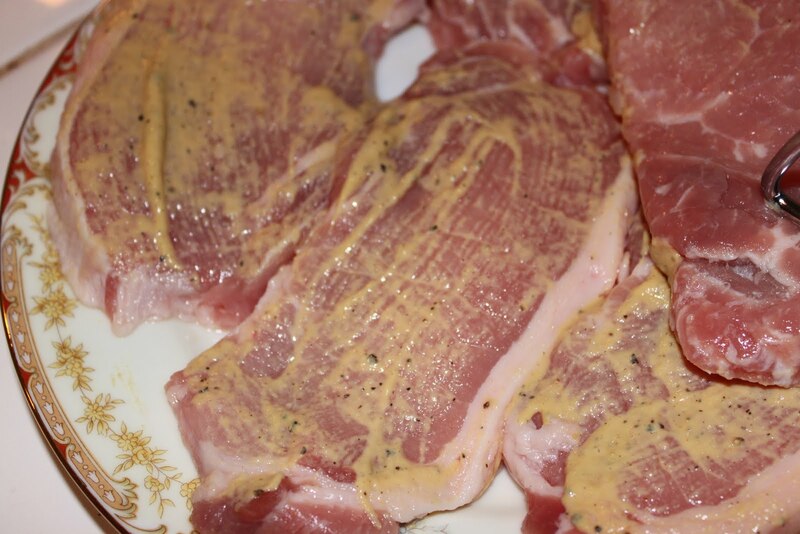 I have used this super-simple Dijon marinade on chicken breast and thin-cut beef steaks with success, so don't be afraid to use another meat. If you have any fresh herbs on hand, a small amount would be nice too. I'd suggest about 2 Tablespoons of minced thyme or parsley, maybe use some lavender if you want it sort of Frenchy like Herbes de Provence. Personally, we like to let the flavor of the meat stand out. It's also just one of those go-to quick and easy recipes when I'm worn out. I'll microwave a veggie in the steamer, usually frozen corn or fresh cauliflower or broccoli. I like to have box-mixes of rice pilaf or cous-cous on hand. Toss one of those in a pot when you start with the Dijon sauce and in about 20 minutes, dinner is ready. If you have a little more time, mashed potatoes are really good with this. 1. 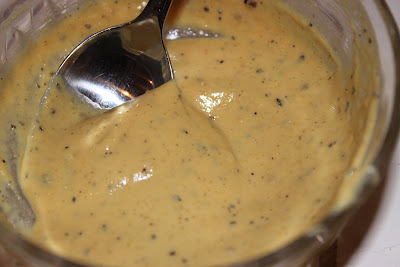 Combine garlic salt, pepper, and Dijon mustard in a small bowl. 2. Brush Dijon mixture onto pork chops, both sides. Let meat rest at room temperature about 5-10 minutes. 3. Preheat skillet or frying pan with the olive oil. When hot, carefully lay the pork chops in the pan. 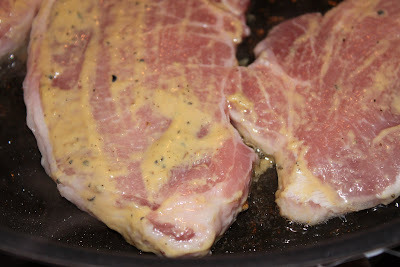 Let cook about 5 to 7 minutes over medium heat or until edges begin to brown. 4. Flip chops and cook other side another 5 to 7 minutes or until lightly browned and juices run clear. 5. OPTIONAL: If you want gravy, remove the chops to a plate and keep warm in the oven. Add about 1/4 cup chopped onion. Saute until the onion begins to turn translucent. Add 2 Tablespoons flour to the pan and mix well. Let cook about 2 minutes. 6. Add 2 cups of liquid to the pan, either milk or chicken stock. Whisk about 1/2 cup in at a time to make sure there are no lumps of roux. Bring up to a boil to thicken.